Pouring spring cocktails in 2014. Photo by Balthazar Digital Media via Facebook. 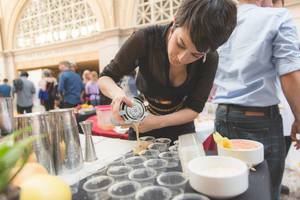 On Wednesday April 29th, head to the Ferry Building for an evening of CUESA’s Cocktails of the Farmers Market. This season it’s all about San Francisco’s fabulous neighborhoods, with bars from all over the city shaking up a cocktail inspired by their corner of town. Participants include Blackbird representing the Castro, Maven and the Alembic collaborating to represent both the Upper and Lower Haight, and La Urbana representing NoPa. Here’s the full list of participants and their drinks. In addition to cocktails, you’ll also find bites from chefs across town, like Fine & Rare, The Whole Beast, and Loló. The evening runs from 5:30-8pm and tickets are $50 per person and include two full-size cocktails, unlimited sample-size drinks, food, and plenty of fun. Ferry Plaza at Embarcadero.